The refreshing architectural complexity of Savannah’s River Street Inn reflects both the building’s importance in the late 1800s and the pragmatics of the cotton industry. Taking up an entire city block and wrapped around a gorgeous central atrium, the five-story structure first operated as a storing, grading, and exporting facility for cotton. The floors of the lower two levels were built in 1817 out of recycled ballast stone with wide, arched doorways to accommodate moving large bales of cotton, while the top three floors, added in 1853, have floor-to-ceiling windows to allow maximum light into what was once used as offices, for the factors. The intricate series of balconies that surround the top three floors - called “Factor’s Walk,” after the professionals who graded the cotton - let the workers observe the unloading and loading process. Today the building’s flickering gas lanterns and hardwood flooring in the lobby, reinforce the inn’s distinguished past, yet all the modern amenities of a luxury hotel are found within. Ideally positioned overlooking the Savannah River, the property opened as the River Street Inn in 1986. 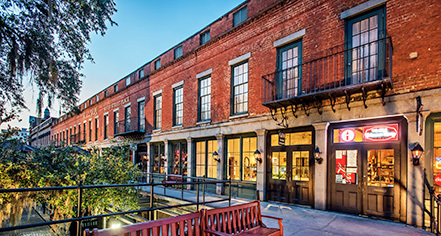 With its historic and architecturally unique qualities - from the many alleyways and balconies overlooking the river and cobble-stone streets, they exemplify the many characteristics that make the River Street Inn, Savannah’s most alluring lodging option. Click here and here to watch videos about River Street Inn. River Street Inn, a member of Historic Hotels of America since 1999, dates back to 1817. 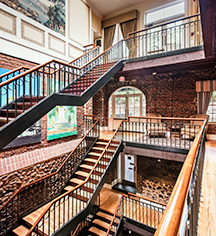 The Inn was originally built as part of the city’s thriving Cotton Exchange and was used for storing, grading, and exporting the city’s main crop. Airport Transportation: Shuttle service is not provided by the hotel. Deposit: First night deposit is required at booking. Extra Person Fees: $15 per person. Hotel/Resort Fees & Taxes: All reservations may be subject to a City/State Tax of 13%. Occupancy Restrictions: Two guests per room. Parking: Self-parking: Available in garage reserved by hotel; $15 per night. Valet parking: Available; $27 per night. Pet Policy: Service animals: Allowed; please contact hotel. Pets: Not allowed. Shuttle Service: Not provided by hotel. Outside services are approximately $30 round trip. The refreshing architectural complexity of Savannah’s River Street Inn reflects both the building’s importance in the late 1800s and the pragmatics of the cotton industry. Learn more about the History of River Street Inn .